World Water Day is March 22, and this year’s theme, “Leaving no one behind,” adapts the central promise of the United Nation’s 2030 Agenda for Sustainable Development that everyone has a right to clean water. Marginalized groups – women, children, refugees, indigenous peoples, people with disabilities, and many others – are often overlooked and sometimes face discrimination as they try to access and manage the safe water they need. NASA Harvest, in partnership with SERVIR, is coordinating with the government of Uganda to project crop failure and drought and, for the first time, proactively plan aid response to those who need it most. NASA satellite observations and technologies are used by many countries to provide early warning of humanitarian risks like crop failures. Now, Uganda is using satellite data to respond proactively to food insecurity from drought and crop failure. In partnership with NASA Harvest and SERVIR, Uganda is using Earth observations and NASA tools to improve lives, save money, increase food security, and promote national autonomy and resiliency in the face of unfavorable weather or extreme weather events and population pressures on land and natural resources. The GLAM East Africa System shows crop and vegetation condition over time using NASA MODIS data, allowing users to monitor crop conditions globally. 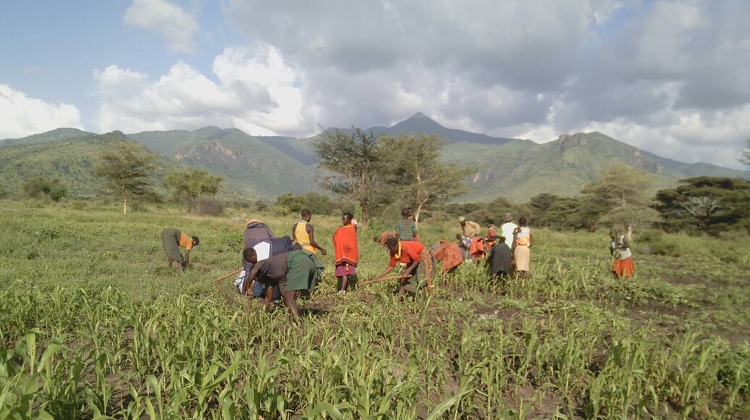 In Karamoja Uganda, the growing season is May through September. MODIS data are the primary trigger for Uganda’s Disaster Risk Financing (DRF) fund. But they also rely on “in situ” observations, partnering with local communities to get information on the ground. The DRF program utilizes low cost, extensible field data collection app that relies on wireless data connections to the DRF program office, to substantiate and validate what the satellites see. Early warning is key. Proactively assessing risk saves money and keeps food on the table for Ugandan families. By May 2017, satellite data showed drought conditions would cause widespread crop failure in Uganda. By August, the GEOGLAM Crop Monitor for Early Warning – an international report using satellite data to monitor crop conditions – confirmed poor production. 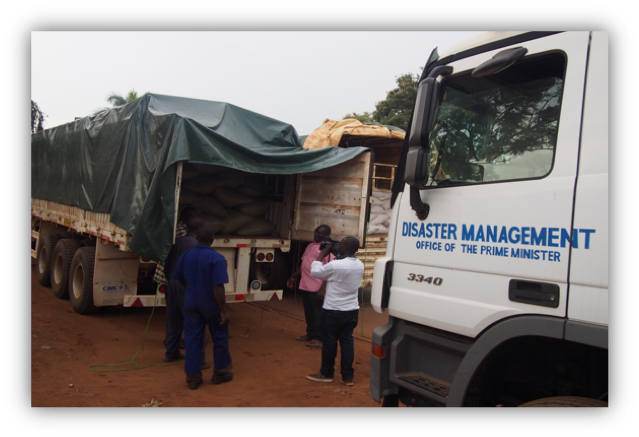 The Ugandan government provided disaster relief aid to 31,386 households – about 150,000 people – and saved USD 2.6 million in the process. In early 2018, they paid USD 2.6 million to 23,388 households, strengthening food security for many who would have otherwise had to wait until the next season’s harvest or food aid from the government. Using this information to identify failing crops means instead of responding to disaster, the government can deliver aid proactively to help prevent disaster from happening. 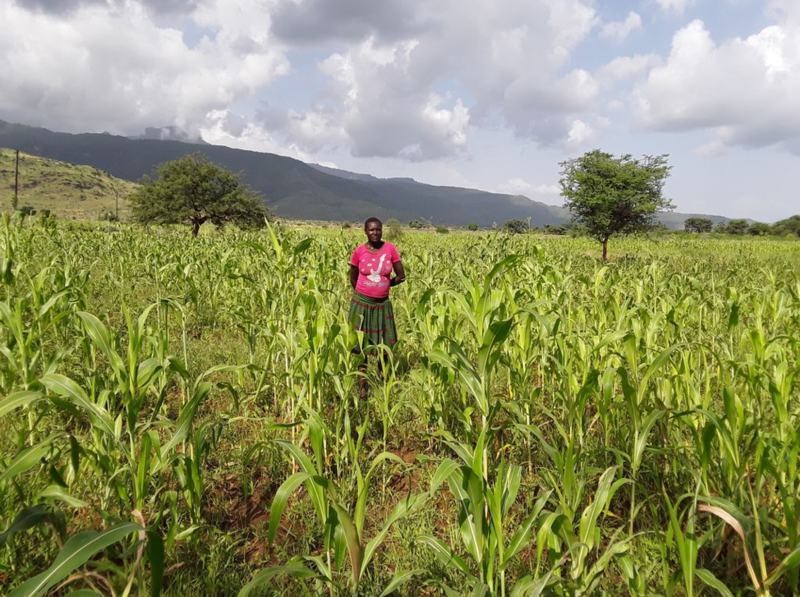 From farmers, to policy makers, to communities prone to drought and floods, the “end users” – people who utilize and benefit from a product – are found across Uganda. 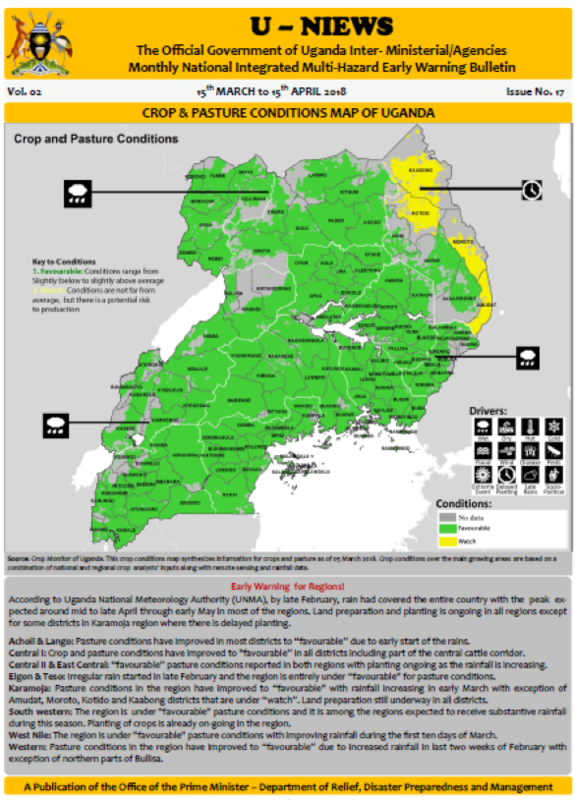 Combined with trainings on using remote sensing for crop monitoring, led by NASA Harvest East Africa Hub Lead Dr. Catherine Nakalembe, this information is included in the monthly Uganda National Integrated Early Warning Systems (U-NIEWS) Bulletin, informing more than 15 million people on crop and pasture conditions across the country. The results are promising, and as Administrator Jim Bridenstine pointed out, demonstrate NASA’s potential to “save lives, grow more food, feed more people around the world, save water resources, and do it in a way that maximizes the utility [of data] for everybody.” That’s not just the reflection from the satellite talking – the future looks bright. In addition to the Ugandan national crop monitor, an East African regional crop monitor is now being hosted by the Intergovernmental Authority on Development Climate Prediction and Application Centre, and national crop monitors are being produced by Kenyan and Tanzanian authorities. These efforts are working to support a national crop monitor for Rwanda as well, further strengthening food security in East Africa.